Last week Dr. Godfrey Mahachi touched the hearts of many by paying tribute to one of the historic features within the hinterland of Gweru, the Mvuma Chimney. Somehow it awoke in me a sense of urgency to contribute to myGweru.com other related aspects, whose link with our beloved city remain incontestable. Today I wish to share memories and information about the founding Catholic mission, which is the headquarters of the Gweru Diocese. This is none other than Driefontein Mission, which has been the embryo of several catholic mission stations. Let me start from outside, before going deep inside in order to illustrate the point raised in the last sentence above. From Driefontein was born the following mission stations: Holy Cross, Chaka, St. Joseph�s Hama, Serima, Mapiravana, and Chinyuni Missions (all in Chirumhanzu). Govo Mission, which relocated from near Mvuma in 1970 to Silobela, as people migrated from Hunyani Reserve, is one of them. We then have Loreto outside Gweru, and Regina Mundi in the City. Chikwingwizha, the Minor Seminary, is the spinoff of the ever-expanding Catholic missionary work. It is at the turnoff between Gweru and Shurugwi, shortly after Guinea Fowl. Lest we forget, the Mambo Press (a Catholic institution), which is well-known for publishing books and other Literary works, is at the heart of Gweru City. The Bishop�s House is in Gweru at 77 Kopje Road, having relocated from Regina Mundi, and the premises at the latter are now used for skills training by candidates who want to become missionaries as Brothers. Now back to Driefontein, which is situated off the main road between Harare and Masvingo, some fifteen kilometres at the turnoff from Fairfield (towards the Eastern direction). It is also commonly known as Guta, and until recently has been surrounded by commercial farms owned by whites. Today, it is reported that all those farms have now been indigenized. Have you ever wondered how Driefontein came to be called Guta? In his book Dzinza Ravagovera vaChirumhanzu naMutasa, Rev. Fr. I. Zvarevashe traces how Goveranyika who died in Mutasa in 1795 was the first chief of vaGovera (name derived from Goveranyika). His brother, Mhepo then led the group of vaGovera, passing via present day Chivhu where he made a beautiful dress (hanzu) for one of the chiefs, hence the name Chirimuhanzu. Mhepo settled near present-day Zoma Mine, in the area called Guzuve, and died in 1820. Originally, this group was of totem Tembo (Duve), but as they were running away from some extended family feud, they then called themselves Shumba-Tembo yokwa Chirimuhanzu. After the death of his father, Nherera went to build his new city called Guta raNherera, where present day Driefontein stands. Some of his lieutenants went to settle in different parts beyond Nyautonge, Mavhaire and Ngezi rivers. Ruminu and Muteyo are some of the forests where people settled which extend to Chamakanda (Shwawumakanda), Chimwavaenzi, and Shayamavhudzi (Mvuma) where plentiful game and fruit abounded. Chamakanda, just to the West of Fairfield Railway Station, can still be seen today. It is a pit/cavity of 10 metres diameter, where hunters used to make fire, and dry meat before going back home with their spoil. Tastier meat was that one roasted with its skin, hence the name (Shwawumakanda (improperly known as Chamakanda today) The grandson of Chigara has a field around the pit, which he has kept sacred. When I visit, we roast green mealies over an open fire, not meat any more as the crop of hunters is now in the dustbin of history. This is a place worth visiting. The other families moved further West to Chaka near Shashe River. The family of Madhibha lives near the River, close to Gonawapotera pool where thieves and witches were drowned. Just across the river is Chivavarira hill, well-known for its significance during raids by the Ndebeles. Tandi and Jaravaza settled near Makosho, and further South other families settled. As you turn at Chaka into the rural area, you will hear names like Chitunya, Hutire, Guramatunhu, Shinyira, Chigara, Matura, Munanzvi, Chipengo, Bangure, Mundure, Kamanda, Takawira, Chiweshe, Machekano, Masendeke, Chituto, Burutsa, Zvarevashe, Mucheka, Mawire, Chipope, Zinyoro, Chakabveyo, and many others. The settlement is interspersed with hills like Chivavarira, Banya and Dungugwi. Govo and Huchu relocated during colonial times, and are found in Silobela and Gokwe North today. At Guta raNherera the family that has remained closest to the original city is: Mhere. Other families such as Maotsa, Manjengwa and Bhidhi settled in Serima, which is part of Gutu today. The Serima Church is worth visiting for its artistic images developed over the years by Fr. Groebber, and was well-known for its church music composition by the likes of Stephen Ponde, a lay teacher. One of the gallant sons in the liberation struggle was Leopold Takawira, and hails from Chirumhanzu. Known as the Lion of Chilimanzi,/i> he died at the hands of the colonial master in 1970, and was buried at Holy Cross Mission beside Maoregwe Hill. After independence, his remains were reburied at the Heroes Acre, and in his honour, Chirumhanzu became known as Takawira District, and the high school in Mvuma is named after him. As Dr. Godfrey Mahachi has rightly observed, the Chimney of Mvuma is quite a spectacle, and the visitor who comes to Gweru will be rewarded for his effort to pass by this old mining town to see the Chimney and the interesting mine dumps. All these are linked to Driefontein in more ways than one, for it is in this background that the missionaries and the Chirumhanzu residents dramatized their existence as they contributed towards what Gweru is today. The story is long, but the point being made is that when you hear someone telling you who the founder of Driefontein Mission is, you will have some idea. But to make the story even fuller, let us now look at history that takes us to the present day. The name Driefontein is Afrikaans for Three Fountains. Just as you move from Hunguru Station towards Muwonde Hospital, there were three fountains, and when the first missionaries settled in the valley near the stream in 1898, long after Nherera and his clan had settled, they named the mission Driefontein. Today the ruins of the first mission settlement can still be seen. The first missionaries were of the Jesuits Order, but later Bethlehem Fathers, originating from Switzerland and nuns from Germany took over. Some of the pioneer Catholics were Chigwedere, Modesto (Tichapondwa), Minya, Mhere, Kumbirai, Egidio, Bhasopo Moyo, Musemburi, Chipere, Reu, Chimbindi, Muteyiwa, Placido, Sixto, Madzivazvido, Sebastian, Julio, Otto, Munyuki, Musemburi, Ivo, Jacob, Chibhovo, Kumbweya and several others who have escaped my weak memory. These were the ones closely associated with the new site, the present-day mission station, which was established in 1908. When you stand by the church building (still in its original state as shown below) and look at the Fathers� House to the North, you will see 1908 written in brickwork. Driefontein, with its rich history, is remembered for six main things today. Its primary school, which was built in 1934, attracted students from Zvinjanja, Gutu, Serima, Chihota, and many other places. Numerous prominent citizens of Zimbabwe are products of Driefontein Primary School. Secondly, many artisans have been trained in the field of plumbing, metalwork, tailoring, home economics, agriculture, motor mechanics, and carpentry. The Mission also boasts of two major hospitals, namely, Driefontein Sanatorium (which specializes in the treatment of Tuberculosis), and Muwonde General Hospital. The latter was a reformatory for young offenders, before converting into a hospital. Fourthly, Driefontein is where the Gweru Diocese Regional House is. When the Bethlehem Fathers came from Switzerland, they were first taken to the Regional House, to learn Shona before deployment to the mission stations listed above. Today the Regional House has become the retirement home of the Catholic priests and brothers. Fifthly, Driefontein is the place where Catholic nuns are trained firstly, as candidates then through Novitiate to full order. The Mother General, head of the Catholic nuns of the Gweru Diocese, is resident at the Mother House. Sixthly, there are fascinating Bushman paintings at Madzimunyuchi Cave near Shashe River. At Driefontein lie most of our heroes whose contribution to the struggle for civilization cannot be adequately recounted in words. 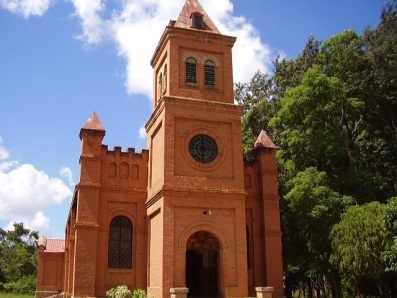 Prominent among them are the likes of Father Cornelius Dober, Paul Bruggisser, Nicholas Bilgerig (the great teacher), Herman Nhariwa, Bishop Tobias Chiginya, Bishop Alois Haene, Bishop Mugadzi, and many others who lie restfully under the pine trees. Prominent teachers such as Joseph Chigoga Takaendesa, Michael Mhere (Teacher Gwiri), Pelagia Mhere, members of the Bassopo Family, Tichapondwa Modesto family, Musemburi family, and many others who have escaped the limited memory repose in peaceful silence.